I figured I’d ask here, just in case – you all are such a brilliant resources! We’re starting to put together the bedroom to be used by some/all of our potential new kids, and also preparing to give up all of us cramming into the tiny little clown car and accepting that people with 6 or 7 kids are van people, at least some of the time. As usual, money is at a premium, and so’s time, but I figured I’d start looking here. Does anyone in my general area (upstate NY near Albany) have any of the following they are looking to unload reasonably cheaply? A good condition, cheap many (at least 8, maybe 9+) passenger van? We probably can’t spend more than 3K here and would love to spend less, but we’d also like it to last, which may not be compatible with the former. Any really cool kid room decorations that do not have Thomas, Bob the Builder, SpongeBob or any other major television characters on them. We need some fun/pretty stuff for the walls, since it has kind of boring wallpaper on it, and we probably won’t get to repapering this year. I doubt I have enough barter to cover a van unless you want 160 copies of _A Nation of Farmers_ for some bizarre reason , but I’m open to full or partial barter in classes, goats, herbs, tinctures, books, vegetable plants, CSA membership, eggs, possibly kosher poultry, apprenticeships, or whatever you can think of, and of course, there’s money. Thanks everyone – I really appreciate the aid! Ok, you know about edible landscaping – you’ve replaced your burning bush with blueberries and your spireas with elderberries. You’ve trained that grapevine over the arbor. Now you are eying that space on your front lawn where the perennial border is (or should be or used to be or is in your head). You want flowers. You need flowers because they make you happy. Maybe you have to grow flowers there if you grow much of anything but grass, because of neighbors or zoning laws. Can you grow an ornamental flower garden that is totally edible? Yes. Yes, you can! I don’t just mean “edible flowers” which, after all, are very cool but not main crops. And I don’t mean something you might add a tiny taste of to your garden. I’m talking about food plants that are beautiful too. Consider it your stealth food garden – and consider it perfect for public places, where you are worried about someone nipping off with your cherry tomatoes or your carrots. Only the well informed will have the faintest idea that these are even food. There’s something magical and fun to me about the idea of a “secret garden” in plain sight. First, a shady ornamental-edible garden – this will work best for light to moderate shade and reasonably moist conditions – very dry or very deep shade won’t work. Ok, even I didn’t know until my awesome partner-in-crime Aaron Newton told me – Hostas are edible!!! I’ve never liked them much, but after I heard the shoots taste like slightly salted asparagus, well, I’m softening on them. So first, hostas! My research suggests that some varieties are tastier than others, but that not much research has been done on this – so here’s an opportunity to contribute useful and important knowledge! Daylilies are a gorgeous and delicious edible plant/flower and will tolerate partial shade, although they do best in full sun (at the southern end of their range, they might actually prefer shade). 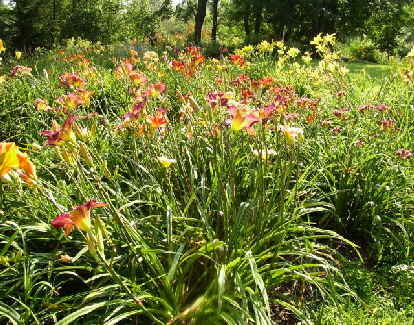 The wild orange daylily will do well in part shade, as do several cultivated varieties, including “Orange Crush” and “Dallas Star.” One source I found suggested that dark-colored daylilies generally do better in shade. I have a Stella d’Oro that does well as well in moderate shade. Daylilies provide two seasons of food – the shoots are tasty fresh and are traditionally dried and used in hot and sour soup, called “golden needles.” The flowers are the best tasting edible flower out there and wonderful in salads. 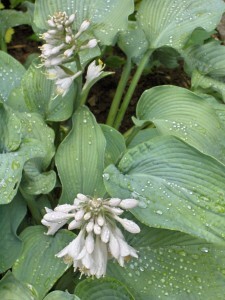 Giant Solomon’s Seal (polygonatum giganteum) is a gorgeous woodland native that offers spring to early summer white bell flowers. It will even take partial sun, but without enthusiasm. The shoots are edible (look like asparagus but taste more like artichokes) as are the tubers (good with butter, I’m told, but I haven’t tried them). Orange Jewelweed -aka Spotted Touch Me Not. Ok, you aren’t going to get more than a tasty snack out of this – they aren’t really a calorie crop, but it is such a valuable plant it is worth it. Jewelweed seeds (you know, the ones that “pop,” which explains the other common name) taste exactly like walnuts – they are delicious. Very, very small – you won’t be making too many cookies with them, but yum. Plus, Jewelweed is the best anti-itch plant around – soothes poison oak and ivy, rashes of all kinds, etc… The leaves are weedy looking, I fear, but the flowers are gorgeous and orchid-like and well worth it. Ramps don’t really flower, but their strap-like foliage is pretty and pleasant all year round, and their flavor is spectacular – my kids beg for ramps. They do look a lot like lily-of-the-valley, so don’t plant them anywhere near the latter, since lily of the valley is quite poisonous. 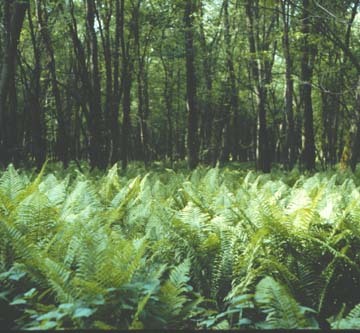 Ostrich Fern – the ideal source of fiddleheads. A delicious and beautiful crop, you get your spring delicacy with ferny beauty put together. 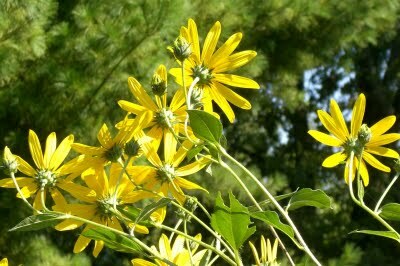 Jerusalem artichokes will tolerate quite a lot of shade, and indeed, are less aggressive that way. They provide delicious tubers that are really wonderful, and provide bright late season color. The only important thing is to keep them from overpowering everything else. 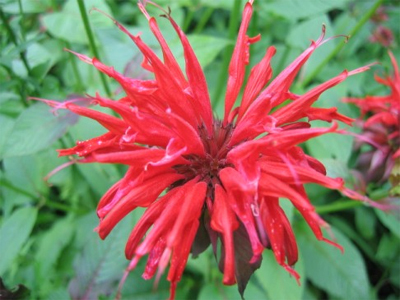 Bee Balm is another possibility – it will probably do well in partial shade. It is prone to mildew in shade, but it is an excellent tea plant and the bright red, pink or purple can light up a border. The flowers are also edible. Finally, let’s anchor our planting with a couple of shrubs – two beautiful black elderberries, providing flowers in the spring and fruit in the autumn, and a black currant, whose leaves can be used to crisp and give a smoky flavor to pickles, while their delicious fruit makes jam, wine or juice. Or if you prefer, red or white currants. All will tolerate partial shade, all are extremely ornamental and tasty! If you live in a warmer zone, you can probably also grow taro (elephant ears) and additional plants. Pansies and Johnny-jump ups are good annuals for shade to fill in any weak spaces and add more color – the flowers are delicious in salads – they will provide color all season long in the cooler regions and spring and fall color in warm places. Tuberous begonias have edible, slightly tart-crisp flowers and do well in shade as well. Ok, now a sunny perennial border with a few annuals thrown in for good luck! As much as I really don’t like hostas (a prejudice I’m getting over) I *love* sea hollies – they are a favorite plant of mine. The roots, roasted, really do taste like chestnuts. They were once upon a time candied and served as aphrodisiac desserts. I’ve not tried the latter . The shoots can be blanched, the leaves are edible and tasty, and they are weird but stunningly beautiful, and come in the rarest of all colors, blue. What’s not to love? Sweet and spicy Codonopsis roots are a delicacy, served in korean style barbecue sauce or used to give a spicy-sweet taste to rice, or added to soups. It is also known as Dang Shen or “poor man’s ginseng” although the compounds in it are not the same as in ginseng. 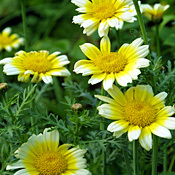 They are an important medicinal also used as food in much of Asia. It does need something to climb on, and the roots usually take several years to mature, but are well worth the wait. In the meantime, the plant is gorgeously ornamental. 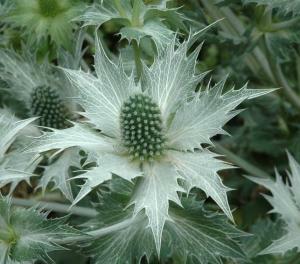 In the warmer parts of its range, it will take part shade, and it will take light shade even in more northerly spots, so it could be part of the garden above as well! 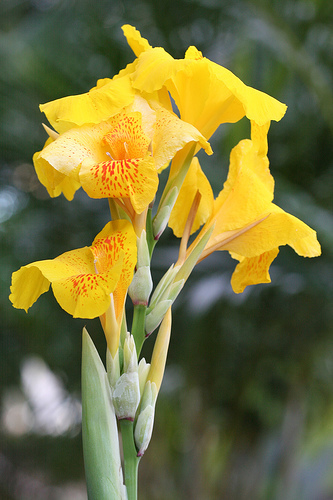 I credit Eric Toensmeier’s _Perennial Vegetables_ for pointing out that ornamental cannas are actually edible. In our range, the tubers have to be lifted and stored over the winter, but that’s a small price to pay for something so delicious and so beautiful. Canna starch is used to make cellophane noodles used Vietnamese and other Asian cuisines, and Canna production for starch is a major Vietnamese agricultural product. Canna tubers do need to be roasted for a long time, but come out meltingly sweet and carmelized and very delicious. Daylilies would be another great addition to this, and you could add Jerusalem artichokes or Maximillian Sunflowers, or just use annual sunflowers at the back of the border to add height and drama. 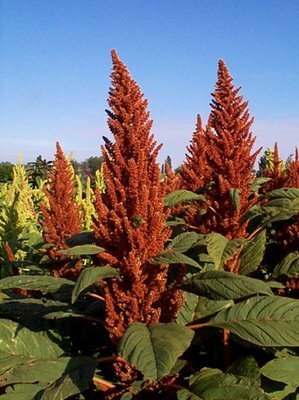 As long as we’re talking about drama and height, annual amaranths come in a wide range of stunning colors, produce edible grain, young salad leaves and cooking greens. They are the perfect ornamental edible. In the grain department, what about Job’s tears? It is perennial tropical grass, grown as an ornamental annual here – and it is lovely stuff. 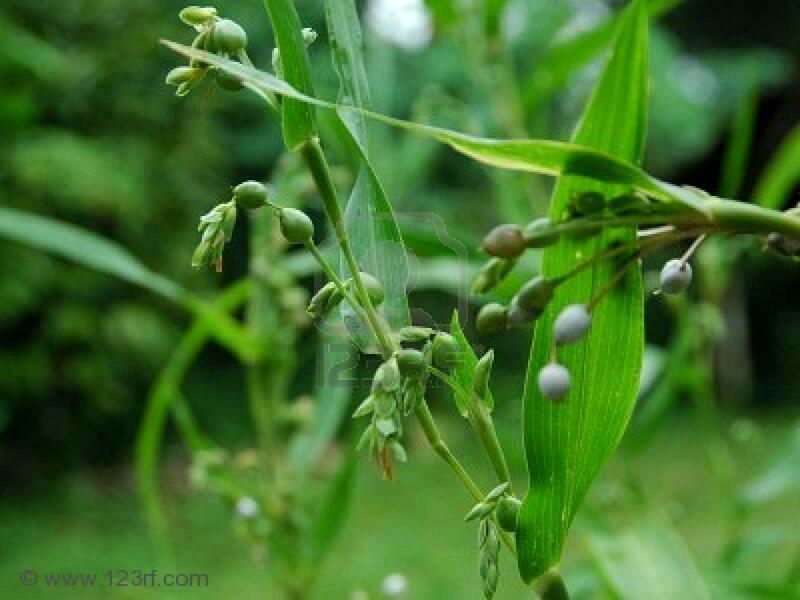 Moreover, the seeds can be eaten as a porridge, ground to make a nutritious drink, or for that matter, laquered and used as jewelry – they have a natural hole that lends itself to stringing. It doesn’t overwinter, but the tufts of grass are pretty if left standing in the winter garden as well. I admit, I simply don’t grasp why everyone doesn’t grow okra in the north – it just isn’t that hard. Somehow, okra and sweet potatoes (another fave) have the perception of being southern crops – but I get good harvests of both her in zone 4. 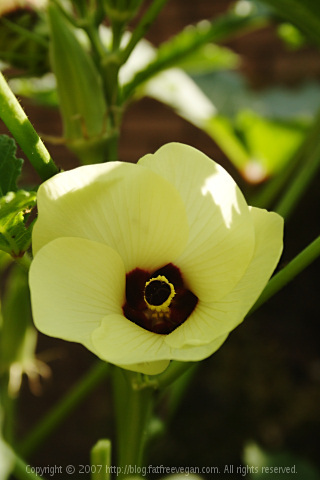 Okra is certainly purty enough to make it into the border. Other more common vegetables worth including in the sunny border are eggplant, ornamental hot peppers, edible chrysanthemum, and “Red Russian” and “Bright Lights” Chard. 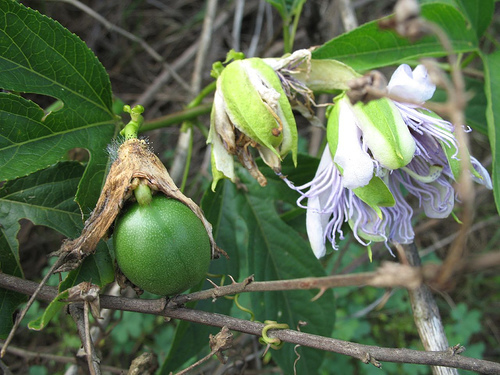 As fruiting things go, Maypop is sort of borderline in the northerly parts of our range, and it can be invasive in the most southerly ones, but there is a happy medium, and I’ve successfully managed to nurture one along in a sheltered spot and get a few passionfruits every year – worth the effort. The stunning flowers are worth a lot too! There are certainly no shortage of ornamental shrubs out there to anchor your border – I’m sure you can think of a bunch. 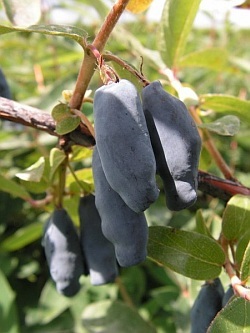 I won’t bore you with blueberries, however – what are some of the unusual ornamental edibles you could grow? Honeyberry is pretty – it is a honeysuckle and has lovely, very early flowers an is the first fruiting shrub in my garden. The berries are good – its only major flaw is that it drops its leaves early in the season, but I’ve heard you can stave this off by fertilizing late. The provide such beautiful early flowers and fruit, however, this seems a small price to pay. 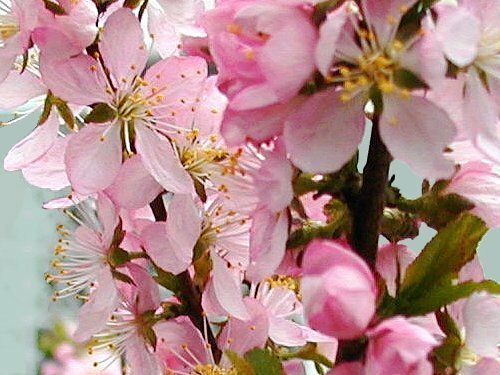 Bush cherries are just plain stunning in the landscape – well worth it. The fruit is ok straight, but excellent in jams and syrups, and my one experiment with it suggests it makes terrific wine. 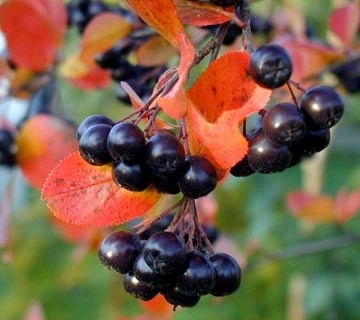 Aronia is my other recommendation – the bright, fiery fall color would make it worth it alone, but the berries are terrific, highly nutritious and the whole thing is the easiest plant out there – put it in a hole and forget about it. If we need to fill in spots in the border with bright annual color, certainly, let’s throw in some nasturtiums which obviously add color, delicious flowers, tasty leaves and best of all, seed pods that taste like capers when pickled. 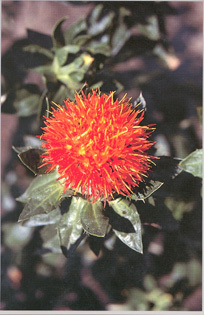 Or how about safflower blossoms, to add to salads and to color our rice without spending bazillions on saffron. For that matter, you could add autumn color by growing saffron crocuses (not annual). 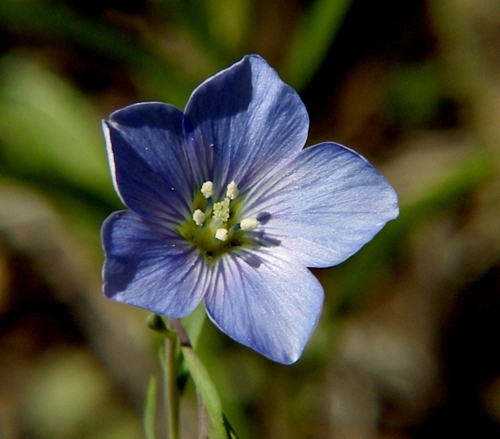 What about flax for edible seeds? And a tuteur or trellis covered with Hyacinth beans and/or scarlet runner beans. See, Gertie, told you I could do it! I’m hoping, btw, that we will be able to offer many of these plants, if not all, in our plant CSA and herb nursery – more information on that coming up ASAP!